It’s Indie Coffee Shop Day on Friday, April 18, 2014, and so we want to urge everyone to visit a local independent coffee shop on that day. It would be even better if you continued the tradition more frequently, checking out different indie shops in your city. Here are five reasons to support your local indie coffee shop, regardless of the day. 1. They contribute to the local economy. When you buy something at a national chain, like a big box store or mega-food franchise, only 13 cents of every dollar stays in your local economy. But when you spend money at your local small business, 40 cents of every dollar remains. If you want to boost your local economy, buy local whenever you can. The baristas at your local coffeehouses learn how to properly create their coffee. They’re not just squeezing espresso syrups out of tubes or pressing a button on a dispensing machine. They learn how to properly grind the beans and pour the espresso. There’s a technique to it, and it takes some practice. I know some baristas who can tell if an espresso will taste bitter or not by how it pours. In his book, The Great Good Place Ray Oldenburg says that third places — a place that is not home and not work — are important for civil society, community, and civic engagement. A coffee shop makes an excellent third place. You can pop in for a quick pick-me-up before work, a calming beverage afterward, a quiet place to read, a place to have a meeting, or to get some work done. 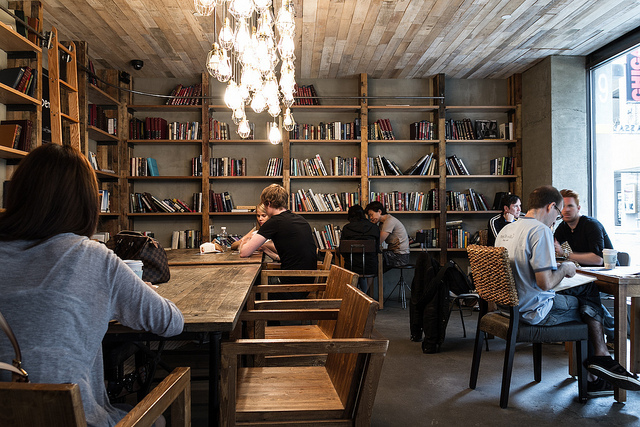 You can do all those things at home or work, but a coffee shop is a nice change of scenery. 4. They’re often family owned. It’s a rare coffee house where the owner isn’t behind the counter, taking orders, making drinks, and cleaning up. There are a few, but even then, there’s a family member nearby, or the owner comes in every evening to tally up the total and make sure everything is ordered. 5. They’re often committed to the environment and fair trade. The place where you’ll often see the biggest push for recycling and reducing, and buying fair trade and sustainable products, are independent coffee shops. They have recycling bins, they purchase recycled products, they make their grounds available for composters, and they ensure that their suppliers make a living wage. Corporate chain coffee does some of this too, but I see the local shops flogging environmental this and fair trade that like the world will end if you throw your paper cup in the trash. Why do you visit your favorite local coffee shop? Leave a comment and let us hear from you.